Image Variations Images of the game’s biggest current stars wearing iconic “42” jerseys in tribute to the legendary Jackie Robinson. This year’s Gypsy Queen release will be defined by its comprehensive 300-subject Base Card set. Collect the biggest early-season 2018 rookies and veterans while searching for unannounced parallels and hidden gems. - Missing Team Name Parallel: limited. - Indigo Parallel: sequentially numbered. This year’s release will also continue to feature Short Printed Base Cards, exclusively featuring retired players and all-time greats! In addition to its thematic Base variations, 2018 Topps Gypsy Queen Baseball will include several unique insert subsets. Jackie Robinson Day Image Variations NEW! Images of the game’s biggest current stars wearing iconic “42” jerseys in tribute to Jackie Robinson. Also look for ON-CARD autograph variations! The popular variations will resurface in 2018, exclusively featuring renowned MLB stars without ballcaps. Tarot of the Diamond NEW! Showcasing “predictions” set to occur throughout the 2018 MLB season. Also look for ON-CARD autograph variations, new to 2018! - Indigo Parallel: sequentially numbered. NEW! 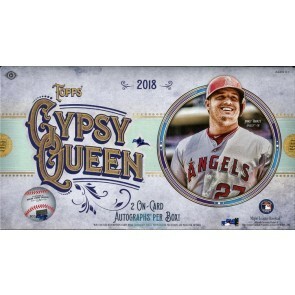 Hobby Boxes of 2018 Topps Gypsy Queen Baseball will deliver two autograph cards per box. A 3-panel booklet featuring an ON-CARD autograph, two player images and an oversized multi-color patch piece. Sequentially numbered. Featuring ON-CARD signatures and jersey or bat pieces. Sequentially numbered. - Black Parallel: showcasing a game-used jersey button, when available. Numbered 1/1. Laces Around the League Autograph Relics NEW! Utilizing the Laces Around the League concept from prior Gypsy Queen releases, but adding an ON-CARD autograph. Featuring cuts of game-used baseballs. Sequentially numbered. Hobby Boxes of 2017 Topps Gypsy Queen Baseball will deliver TWO autograph cards per box. - Black & White Parallel: sequentially numbered. HOBBY ONLY! A mini autograph set exclusively featuring the top early-season 2018 rookies with ON-CARD signatures. Sequentially numbered. Fortune Tellers Mini Autographs NEW! This year’s release will also include unannounced autograph variations in addition to the content referenced above. 2018 Gypsy Queen will deliver a wide assortment of coveted, low-numbered autograph memorabilia cards! Each subset below will include a one-of-a-kind Black Parallel. Featuring ON-CARD signatures and jersey or bat memorabilia pieces. Sequentially numbered. A 3-panel booklet featuring two player images and an oversized multi-color patch memorabilia piece. Sequentially numbered. Pull-Up Sock Auto Relics NEW! Featuring MLB Authenticated game-used bases from a 2017 Opening Day game and an ON-CARD signature. GQ Glassworks Box Toppers HOBBY ONLY! Individually-wrapped chrome cards showcasing design work of the Gypsy Queen era. Featuring today’s biggest stars and rookies. 1 per box! - Also look for low-numbered autograph variations featuring ON-CARD signatures!